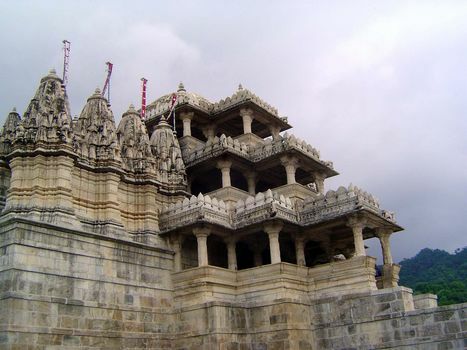 Ranakpur is one of the best-preserved medieval Jain temples in India. 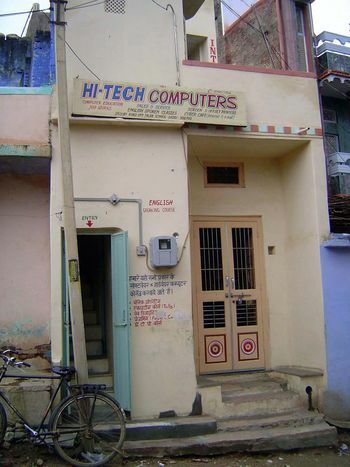 Less well-known and accessible than the Dilwara temples near Mt. Abu, it was remote enough that Aurangzeb, the most austere of the Mughals and an iconoclastic terror, did comparatively little damage to it. That's why James Fergusson could come by in the 1830s and judge the temple "still nearly perfect." 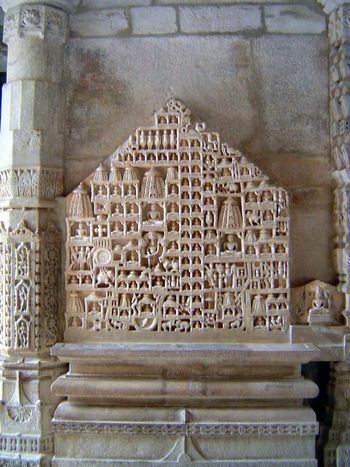 It was, he continued, "probably the most complicated and extensive Jain temple in India, and the most complete for the ritual of the sect." 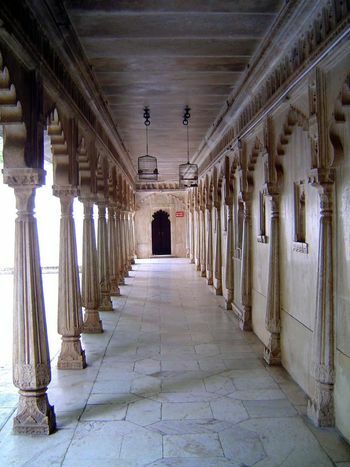 Dacoits had taken up temple residence late in the 19th century, but they were evicted about 1900. Some restoration work was then done in the 1930s and 40s. Even so, the temple was still much as it had been when consecrated in 1440. 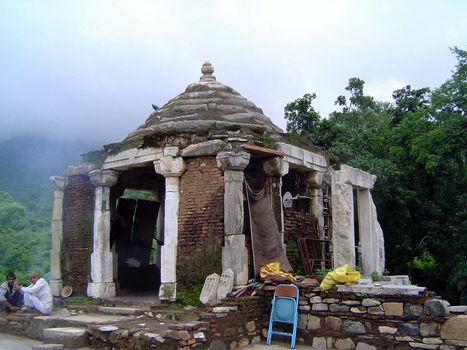 For more information, see Saryu Doshi's Dharna Vihara, Ranakpur (1995) and Lothar Clermont's Jainism and the Temples of Mount Abu and Ranakpur (1998), both with photographs by Thomas Dix. 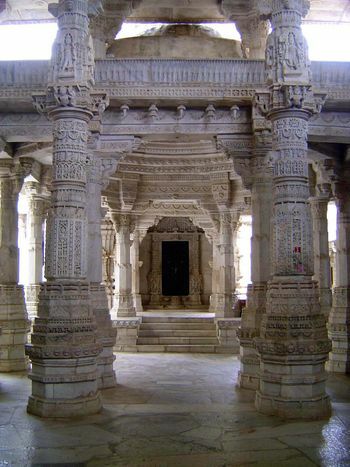 Like most Jain temples, the exterior wall is severe, only the roof hinting at the exuberance of the interior. The floor plan is a square 200 feet on each side. Four images of Adinatha are housed in the central shrine, one facing each of the cardinal points. The western approach (shown here) is the most important, however, and so the central shrine, under the tallest shikara or spire is slightly east-of-center, making the western approach the grandest. You can't hear it, but the flags atop the small spires have bells that tinkle in the breeze. Adinatha? Jains believe that each cycle of existence has 24 Tirthankaras, men who have learned how to find salvation. Adinatha was the first of the 24 in the present cycle. The tri-level design mirrors Jain cosmology, in which humans live in a middle world, between heaven and hell. One of many standardized trikas, or vestibules. Lying flat atop the low lip, two conch shells symbolize purification. On either side of the cylindrical stoop and emerging from the wall behind it, guardian makaras, mythical serpents with bulging eyes, rest like half-submerged crocodiles. At the base of the jambs are two dikpalas, stave-carrying guardians of the cardinal directions and, by extension, the temple. A close-up of one of the eight dikpalas. This one, guarding the west, is Nirutti. 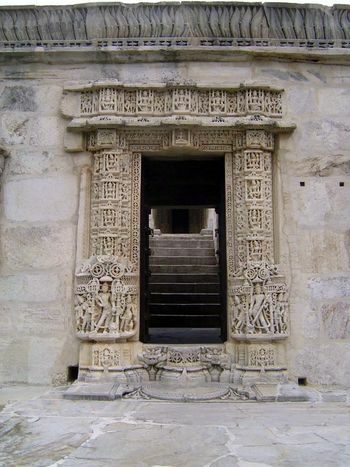 Between the entrance and the central shrine is a mandapa or columned hall with, in this case, three levels. 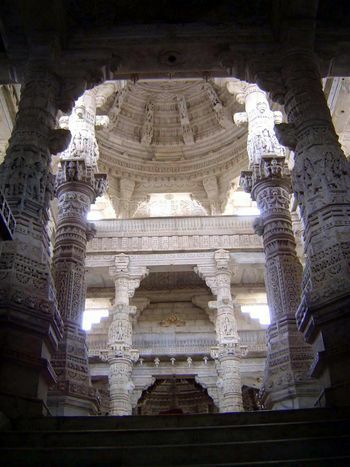 The dome is false--corbelled--not because the true dome was unknown in 15th century India but because the accepted style of Jain temples called for the older form. 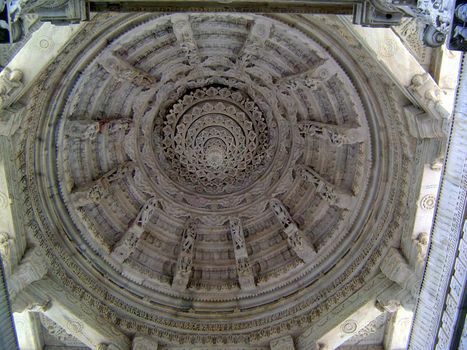 The dome of the western mandapa rests on an octagon supported by eight pillars. The 16 radii of the dome carry images of the vidya-devis or goddesses of knowledge. 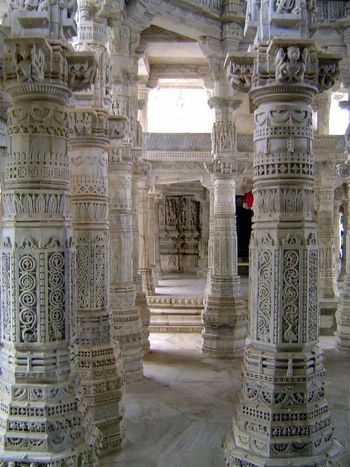 Each of the hundreds of columns--they are stacked drums rather than single stones--is unique. The less grand eastern approach to the central shrine. 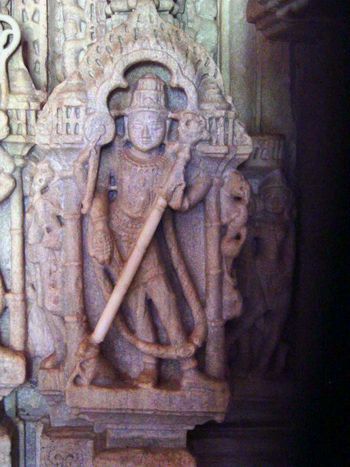 Note the ganas or pot-bellied dwarfs supporting the capitals; like many of the temple's details, they are part of the cultural repertory of India and are as likely found in Hindu and Buddhist architecture as here. 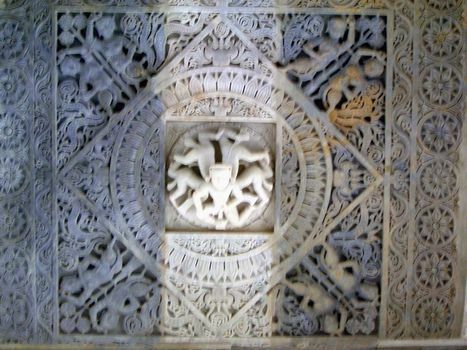 The center of the ceiling in one of the entrance halls, or balanakas is decorated with a kichaka, a bearded man with five bodies representing fire, water, heaven, earth, and air. Another entrance has this iconic representation of Mt. 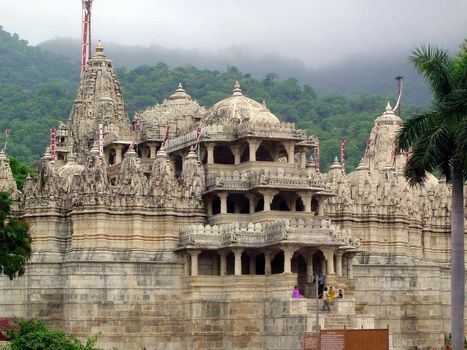 Shatrujaya, where 863 Jain temples cluster near Palitana. 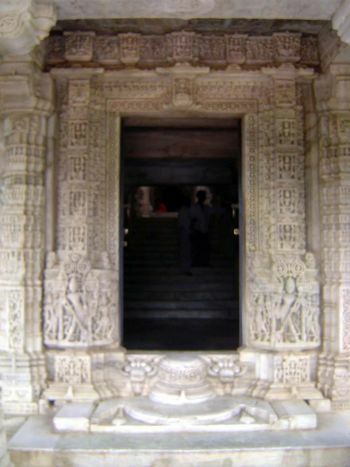 In the back of the temple is a courtyard lined with 80 or 84 deva-kulikas, or subsidiary shrines. Different sources give different counts, but the number in any case is explained as a multiple of 24 (the number of tirthankaras in each cosmic cycle) plus some of the four eternal tirthankaras in each cycle--Adinatha among them. The 84-count includes three sets of 24 (past, present, future), plus a dozen eternals. Many much simpler temples cluster nearby. 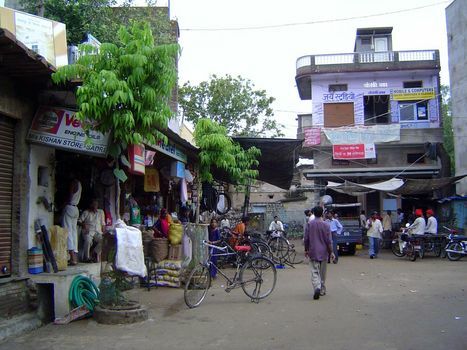 The nearest town is Sadri. Walk? 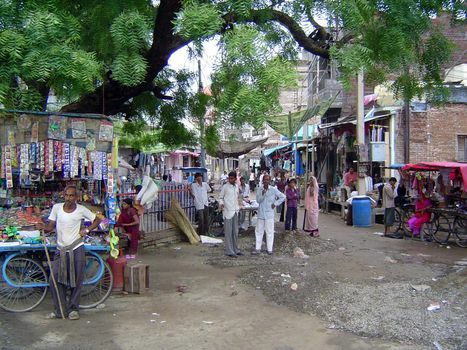 Road crossing in the town center. 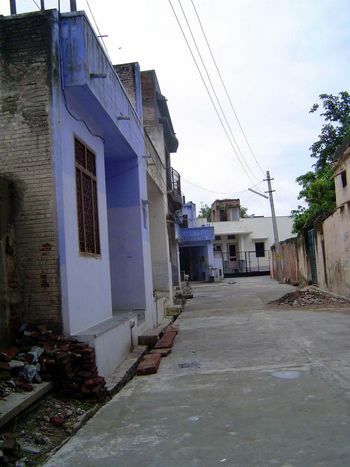 Residential lane, with the same blue so common in Udaipur. 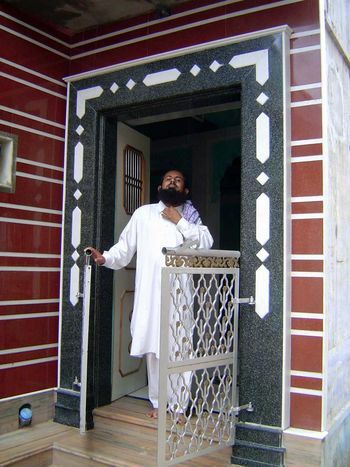 Welcome to the local masjid.